This heater is portable and simple to operate. All parts have easy access for quick service and routine maintenance. 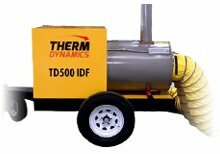 TD heaters meet OSHA standards and have CSA or ETL approval, with a design to withstand the toughest climate and weather conditions. 18 years operating in Extreme Conditions in the Canadian North. Heating for aircraft cabins, fluid lines and luggage bays. Preheat aircraft engines and ice removal on jet turbine blades. Heating for remote, “off gate” aircraft, ground support equipment and facilities to improve productivity and work place safety. Function as a portable maintenance station with High Spot Heat and a generator to run tools, lights in extreme conditions. Hanger heating while servicing aircraft and other GSE equipment. Moisture drying and ice melting of luggage bays, maintenance facilities and ground equipment. Easy access to all maintenance components and minimal operation supervision. Low humidity, high CFM for drying. Reduces relative humidity. Programmable CO Detection. Clean, uncontaminated air output improves working environment. No carbon monoxide poisoning risk. Set and Leave Controls – Auto Modulation. Halliburton, Conoco, Exxon, Shell, BP and Anadarko currently utilize our heaters in their fleet. Available options include custom paint, ducting, ducting storage, recirculation inlets, operational strobe light, emergency shut-down button and many more.